4InkJets has been in business since 1999 selling brand named, remanufactured, and compatible print cartridge products. Located in Long Beach California they sell many brands including HP, Canon, Epson, Brother, Lexmark, Dell, and Samsung. 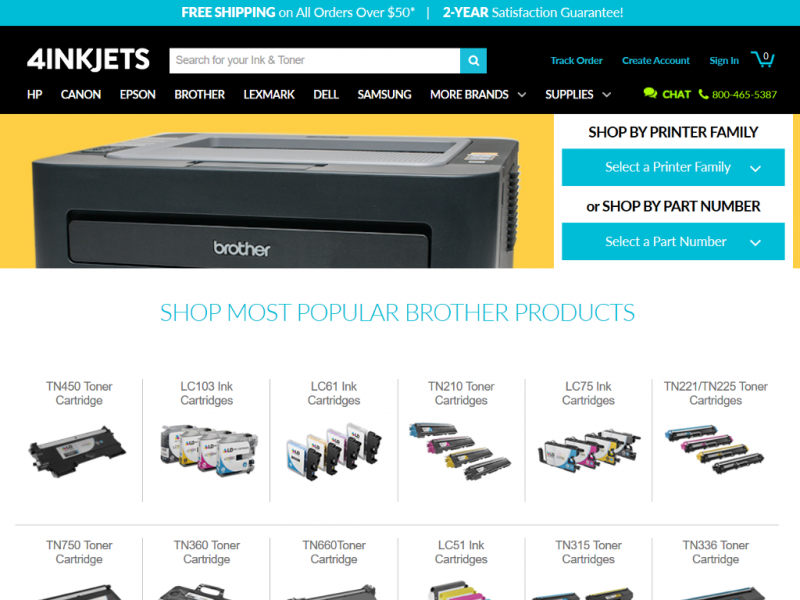 4InkJets.com sells toner and ink cartridges from over 50 printer manufacturers for thousands of printer models. You can also purchase printer cables and ink refill kits (Cannon and HP brands only) from the Supplies menu. 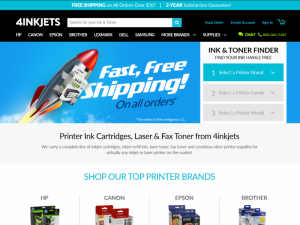 To find your printers cartridge on 4InkJets you can either search directly for it from the home page or click on your printers manufacture listed in the top menu. Searching is very easy as the search drop down auto populates with matching print products as you type. It doesn't matter if you start with the product brand or enter your printer's model number you will soon find your printers supply page. The supply page lists all compatible products. A picture of each item is available along with a description, a price, and if it is in stock. Many products also contain videos which gives you more information about the product and how to install it. Every product available can be reviewed. People who have bought the product before can submit a 1 to 5 star review along with a comment and indicate if they would recommend this product to their friends. A link to these reviews can be found with each product listing. Some of the compatible 3D Printer for these filaments include manufacturers like Afinia, FlashForge, Lulzbot, MBot, OpenCube, PrintBot, Reprap, Robo, Solidoodle, Up!, Ultimaker, and more. Unopened cartridges, refill kits, or cartridge recycling mailers may be returned within 2 years of purchase for a full refund of the purchase price or a credit of the purchase price towards an exchange. Name brand cartridges (Apple, Canon, Compaq, Epson, Hewlett Packard, Lexmark) are covered by their respective manufacturer's warranties. 4InkJets remanufactured and compatible print cartridges are backed by a 2 year 100% satisfaction guarantee. If you find a problem with your order, 4InkJets will refund your purchase price or exchange your item (your choice). On all returns or exchanges shipping charges are not refundable (unless a packing error). 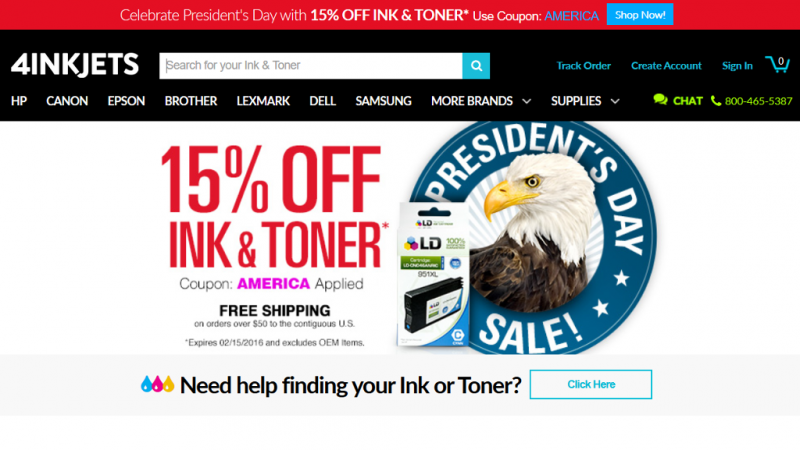 By shopping at 4InkJets you can save up to 75% off the most popular printer brands when compared between remanufactured and compatible cartridge prices, and OEM cartridge prices. 4INkJets accepts all major credit cards, money orders, checks, and Paypal via the online checkout process. Orders by check will not be shipped until the check has been received. All orders shipping in the contiguous United States include free shipping (HI, AK, APO, PR, Guam, etc. excluded). Rates to Canada are based on weight and take longer to receive because of Customs inspections at the border. 4InkJets does offer UPS 2nd Day and Overnight shipping. 2nd Day shipping options are available during the checkout process. If you would like to get your package delivered overnight you can get a shipping quote contacting 4InkJets directly (this option is not available online). One of the most popular printer toner and ink cartridge suppliers online and they have been in business the longest as well. Searching the internet found very little negative reviews. What ones we did find 4InkJets was quick to respond with a resolution that in most cases met the customers expectations which explains why the Better Business Bureau has giving them a A+ rating. A 2 year 100% Satisfaction Guarantee means their is little risk when ordering from 4InkJets. If the cartridge doesn't meet with your expectations you can return it without the hassles you would fine at other online retailers. With the cost and quality of 4InkJets remanufactured printer cartridges along with free shipping you will fine about the cheapest option both online and off, for your printers needs. I purchased a fusier for my Lexmark TS652DN on 09-07-2018. Upon arrival, I found out that it did not fit my printer. I called their customer service number and was told that I can't return the product. I emailed their customer service and was told the same thing. Yes, it was my fault for not checking all the numbers, but if I had known they have a "no return" policy I would not have ordered from them. They did not mention their return policy during the checkout process, they did not mention it on their invoice they emailed me, and nothing in the box when I received it. I am retired and am on a fix income now. My grand kids who stay with me during the week are in high school now and they are always printing stuff off for homework. Before I use to try to get them to ration their printing by printing at school. This was before when I use to buy my ink at Bestbuy. Since then I discovered how much cheaper 4inkjets was and I have never looked back. I almost get 2 for the price of 1 when compared to Bestbuy. I never have had trouble with any of their cartridges either. I ordered some black ink cartridges for my HP printer. They were refurbished so the cost was cheaper. Both of them also did not work and where not recognized by my printer as being full. Customer service really didn't seem to care but I did end up returning them and got some new ones. They work but I am not holding my breath for how long. This is the 4th time I have bought from 4inkjets. The service has been really good. 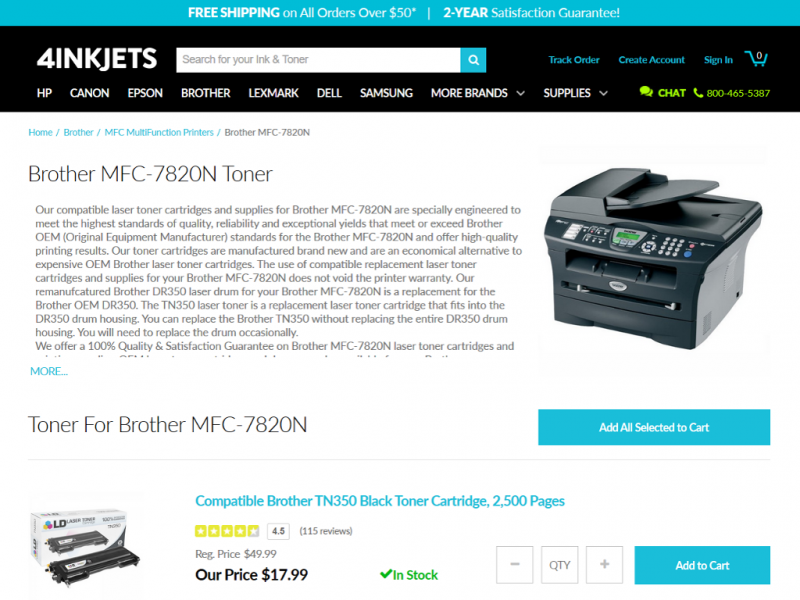 It is easy to find the cartridges you need for your printer and it just takes a few clicks to order what you want. I never had a problem with them when I have ordered. Definitely recommend the secondhand cartridges as they are much cheaper than buying brand new and come with the same warranty. Never had a problem with them and will continue to use 4inkjets. Received my ink within 5 days of ordering and it fit in my printer fine and worked perfectly. Not as quick as going to the store.